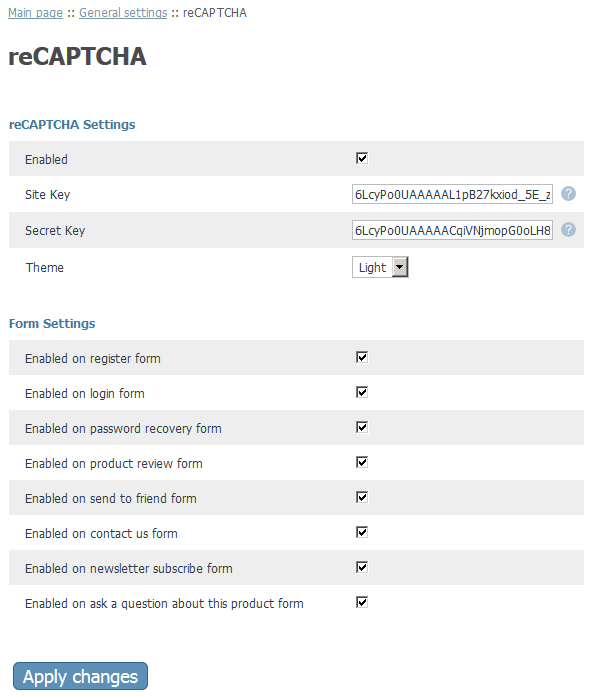 29th Mar 2019 - Download - modules/reCAPTCHA/recaptchalib.php updated again to prevent PHP warning again. Thanks to Paul. install.txt tidied up a little. 28th Feb 2019 - Download - Only modules/reCAPTCHA/recaptchalib.php updated to prevent PHP warning from occurring. 28th Jan 2019 - Download - Update, login popup improved, added to 'ask a question about this product' popup, tested with v4.7.10. 11th Nov 2017 - Download - Update, additional module settings to enable / disable reCAPTCHAs (see below), now works in login popup, v4.4.x - v4.5.x patch included. blah, I just spent $150 on the xcart marketplace one and installed it already with your reboot template..
oh, I wasn't aware there was such a mod for X-Cart Classic on the marketplace. The module you purchased is better, as it takes care of all forms, albeit more expensive. I'm currently only seeing dodgy emails mainly via register.php, but that may change over time, in which case this mod will be updated accordingly. yes! well you should def add it to the 'add a review' section.. I installed the reCaptcha on the XC4.1.12 site a few months ago just for the reviews.. an easy way to do it is to replace the code for the current image verification software! alright back to modding the reboot theme for the new site.. nice theme by the way.. I haven't had any problems with bogus registrations so much as bogus product reviews. I hate to change it to requiring login but that's probably my next step. Actually I double checked and the bogus registrations were among those making fake reviews. So it seems like they are getting around the registration necessary for reviews and registering first and reviewing next. My product id 52 and 1352 are the only ones being spammed in the reviews. oh using BSCE's slow review system. not so slow after I memcached it..
anyways, switching to the XC advanced reviews for the new site. we manually review them too.. just making it easier for customers. alot easier to click a button instead of filling out the recapcha numbers. I just installed reCAPTCHA for X-Cart Classic on my 4.6.6 Gold. I looked at the X-Cart Marketplace add-on, but I don't enable most of the forms it added reCaptcha to, and Phil's install for registrations and contactus was very easy, and worked immediately. I had been getting bogus registrations and contact us forms (5-10) daily for about 3 weeks.